Last 22nd of March we started organizing a series of talks under the name Xerrades Divulgatives (Informational Talks) in which our student members and collaborators are invited to present a topic related with geology and their studies and experiences. First session was the turn of those students that participated in the field trip to Morocco with the SGA Marrakech Student Chapter. 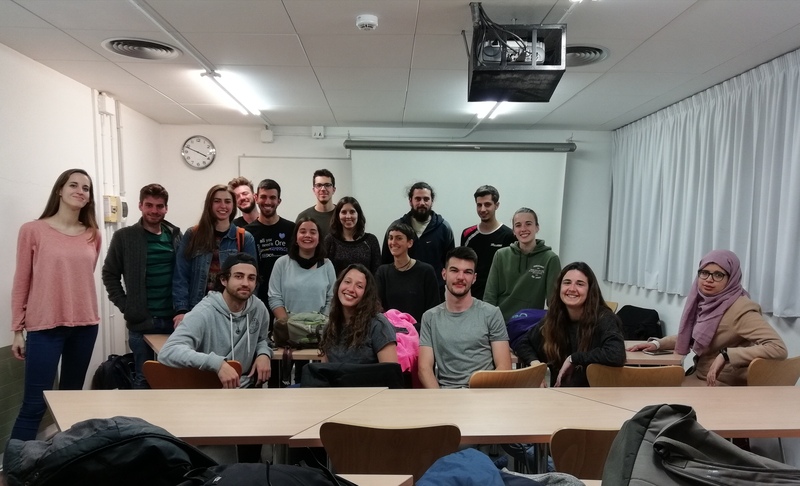 The talk was given by Oriol Vilanova, Berta Sagués, Malena Cazorla, Laura Poll and Joana Lluch, undergraduate Geology students from the University of Barcelona, under the title “Sortida de camp al Marroc” (Field trip to Morocco). The 2nd session of the Divulgative Talks was last 30th of May. Sebastián Betancur, an undergraduated exchange student from the Universidad Nacional de Colombia, gave the talk “Textures and mineral chemistry of Fe-, Ti-oxide ores in the Santa Marta anorthosite Massif, Colombia”. Sebastián gave a general introduction to the geology of Colombia and centered the talk in the Santa Marta anorthosite Massif, from which he is studying Fe- and Ti-oxides. He shared his experiences in the field during the sampling campaign and his experiences as an exchange student in our university. The audience showed great interest during the talk and found it very profitable.